Many companies find it confusing to implement Advanced Product Quality Planning (APQP). The lack of resources may also contribute to the need for APQP Support. Quality-One provides APQP Support for strategy development, tools facilitation and contract services, which enhance problem prevention during product and process development. Quality-One has developed an approach to determine the level of applicability of APQP, based on potential value. APQP is growing in use across a diverse spectrum of industries. It is no longer an automotive-specific process, as non-automotive industries using APQP currently out number automotive usage. Our APQP Support Services have a proven track record of providing value as measured by, time to complete product and process design, improved utilization of engineering resources, fewer problems at launch and improved customer satisfaction. APQP Facilitation is very efficient. 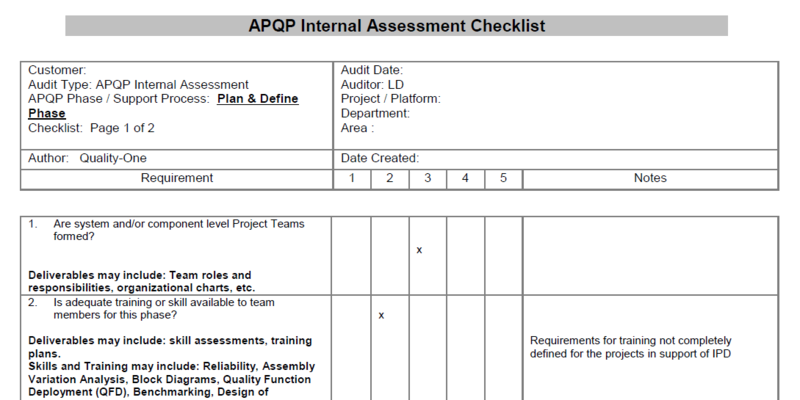 The total cost and time impact of a poor APQP activity is not initially measured by the organization. 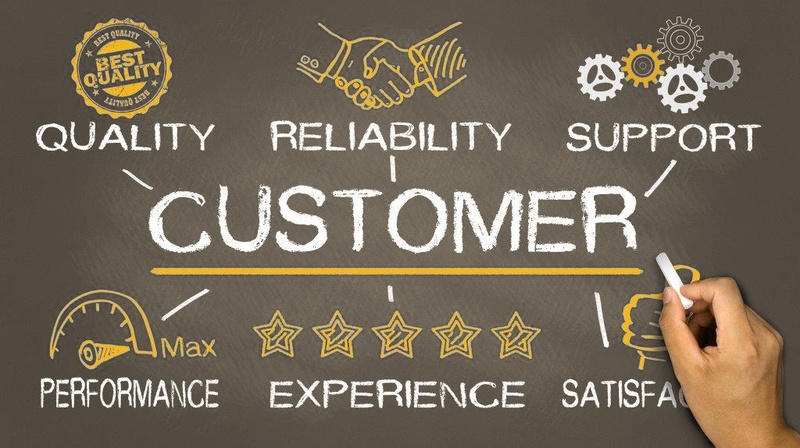 The cost of recalls, problem solving and lost customers is only felt after the product or service is launched. This is the aftermath of poor planning. With shorter development times, fewer engineers and technical personnel dedicated to a project, APQP methodology can improve Product Development (PD) efficiency. 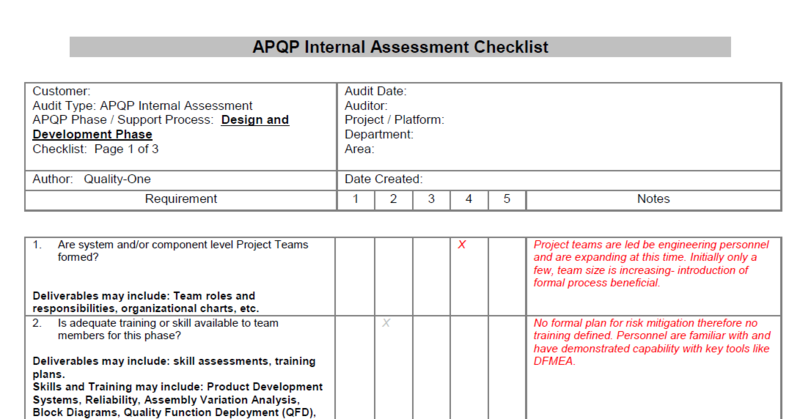 APQP without facilitation and support is often described as tedious, boring and sluggish. 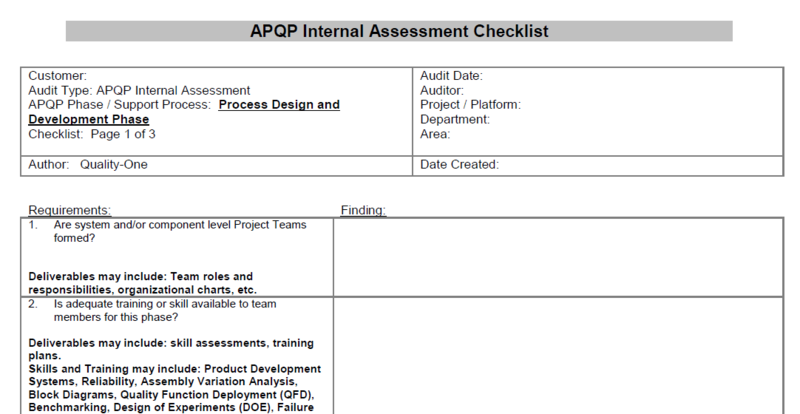 The total time to complete APQP, considering resources and number of development hours, is shorter when experienced with a skilled Quality-One APQP Facilitator. Our customers report greater than 70% reduction in development time and therefore their resources are utilized more effectively on the actual design work. The results of APQP Facilitation are measured in mitigation actions on risk discovered and flawless launch.